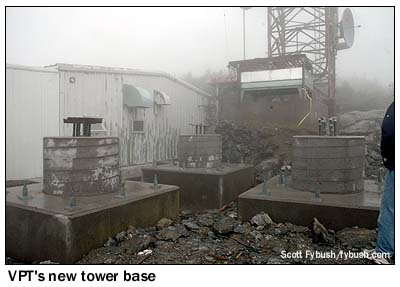 It's been four years since we featured Mount Mansfield, Vermont here on Tower Site of the Week. 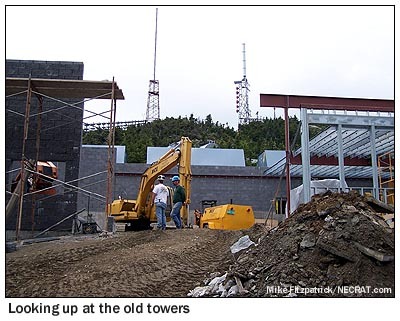 Back in that 2002 profile, we noted that "the broadcasters here have been hung up in negotiations for years now about the construction of a new tower," stalled by difficulties with the state's Act 250 environmental protection laws and with concerns about changes at the top of Vermont's highest mountain. 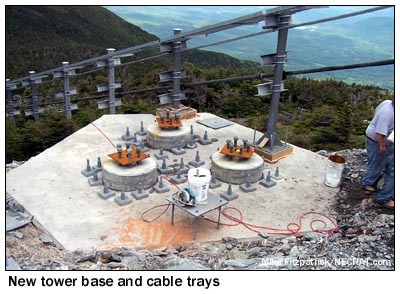 There is, at long last, some good news to report from Mount Mansfield: construction is now very much underway on a project that will completely transform the mountain's peak, broadcast-wise, by the time analog TV goes away in 2009, replacing the three existing towers spread out across the mountain with three lower-profile monopoles, and replacing most of the existing transmitter facilities along the way, too. The space marked "WCAX-DT" at the right side of the old building is the spot where the WCAX garage was. It's been completely torn down, as you'll see in a moment. The room between WCAX-DT and the living quarters will eventually be home to the mountain's two FMs, Clear Channel's WEZF (92.9) and Vermont Public Radio's WVPS (107.9). 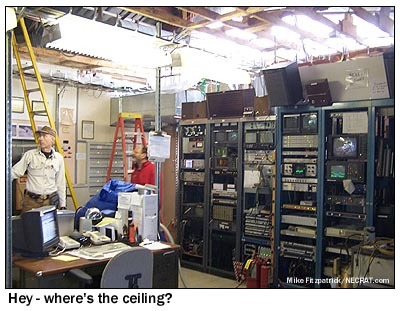 But for the moment, that space is still occupied by WCAX's analog transmitter plant, which needs to remain in place until analog TV goes away in a few years. What to do? Yup...they're building the new building completely around the old transmitter room. The roof of the old building is already gone, replaced by the much higher roof of the new structure. The old front wall is still there, for now, but it will go away once the new front wall is finished. (So will the sun glare from the old windows, which could actually be seen all the way down on I-89, far below the mountain.) 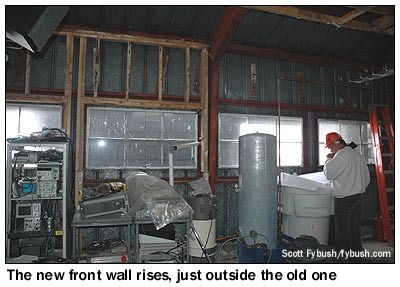 Once the new walls and roof are all finished, the old walls will be removed in pieces, while the WCAX analog facility remains - at least for a little while. Some parts of the analog facility that we saw in 2002 are already history. 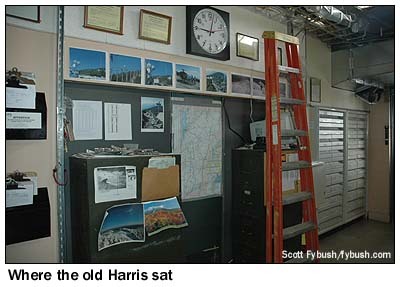 The old Harris transmitter is gone, replaced by a row of cabinets, and that leaves just the newer modular Harris (with power modules along the back wall and exciter out of frame to the left) to keep Channel 3 chugging along for three more years or so. The door to the right of the Harris power modules that once led to the garage now leads to the outside - but not for long. The big concrete slab that now extends east from the old building will eventually become a series of transmitter rooms. Here we must digress for a moment to note the rather odd state of the DTV transition in the Burlington market: unlike any other market in the country, there hasn't been one yet. Until this building is completed, there's simply been no space for DTV transmitters on the mountaintop, and until the new towers are done, there's no space for antennas. Recognizing the unique problems these stations face, the FCC's been lenient about the deadlines for getting DTV on the air, so far. Once this building's done, though, the first room after the FM transmitters will be home to WCAX-DT, which is presently allocated to out-of-core channel 53, but which has negotiated the use of channel 22, presently the analog home of ABC competitor WVNY-TV. 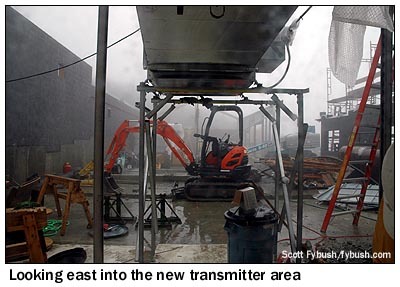 (WVNY's current tower, elsewhere on Mansfield, will come down when its analog service ends.) The next room will house NBC affiliate WPTZ-DT, licensed to Plattsburgh, N.Y. and operating on channel 14. 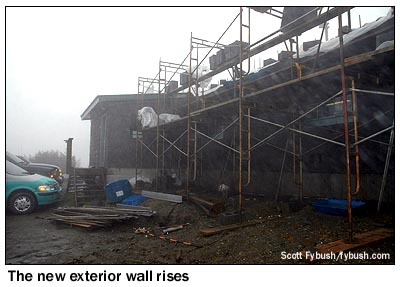 (What will become of WPTZ's existing analog channel 5 facility on Terry Mountain in the Adirondacks? It will presumably continue to house its existing FM tenants.) The room after that will house WVNY-DT, on channel 13, and its quasi-sister station, Fox affiliate WFFF-DT 43. (WFFF's analog signal, on channel 44, is also on Terry Mountain.) And beyond those will be a room full of generators and power equipment. The other two towers will rise from new footings being built just below the tip of the "nose," where the current WCAX and WETK towers sit. Connecting those towers to the transmitter building below is a nifty three-tiered cable tray, which went in earlier this spring along the steep slope of the mountaintop and is now carrying WCAX's analog transmission line up the hill. I'm not quite sure how these two towers will be configured, except that WVNY-DT, as the lone VHF DTV here, will inevitably have its own separate antenna, and that WEZF and WVPS will share a Shively master antenna on one of the towers. 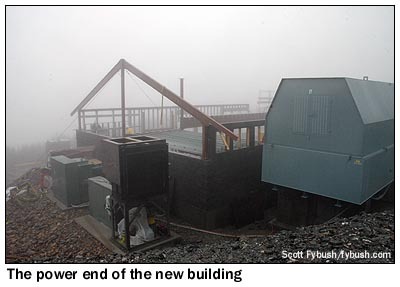 We'll be back up to Mount Mansfield as construction progresses, with more updates on this project. Stay tuned!